We spent seven days at an FMCA rally in Berrien Springs, Michigan. This town is located in southwest Michigan ten or so miles from the eastern shore of Lake Michigan and perhaps is best known for its Seventh Day Adventist College. What we discovered this meant for the casual visitor is that most stores are closed on Saturday and there are many stores and restaurants that specialize in Vegan products. 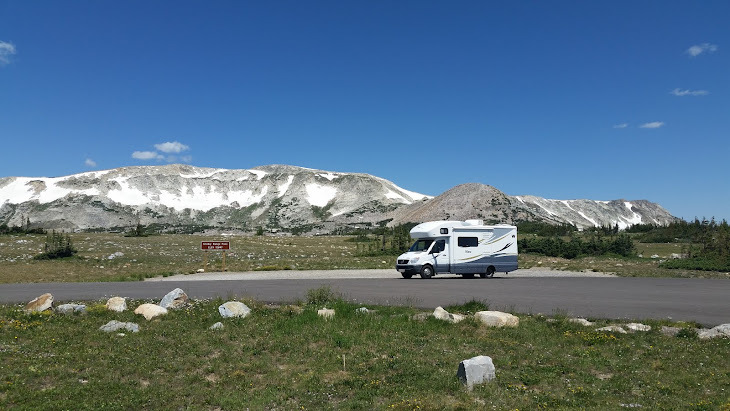 FMCA is a social group of motorhome owners that gather and have fun at various rallies and conventions around the country. This was our first event with this group and also the largest rally we have attended to date. 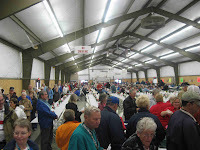 There were approximately 450 coaches in attendance and we were parked all over the Berrien County Youth Fairgrounds, which proved to be a great venue for this kind of gathering. This did not come as a surprise, as we found out that they have been coming here for over thirty years for this annual event. 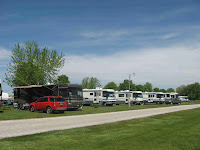 It was fascinating to just walk around and see all the various types and ages of motorhomes that attend and talk with the many campers who come to enjoy themselves. You could discover what they had done to them and what they were having done to them by numerous vendor and repair groups on scene. These events are designed for fun, fellowship and learning. 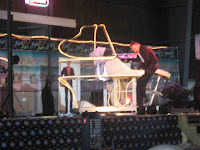 There are numerous seminars on topics of interest to this hobby and in some cases lifestyle. There were also two halls full of vendors selling their wares that were in some way related to motorhome ownership. There were also a number of motorhome dealers who brought dozens of coaches to the fairgrounds for us to look over, in case the urge for a new coach would hit. This alone was much larger than some dedicated RV shows we have attended. And then there was the food and entertainment. With around 1000 people attending the lines for the food hall could get quite long, but they kept things moving and it went amazingly fast. Not being that fond of food served in this manner, we only attended one of these events. 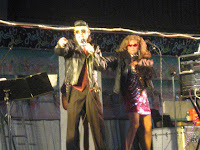 There was entertainment on the grounds every day of the rally, an evening show each night and there was even a classic car rally on Saturday, where the owners sought our votes for the best of show. 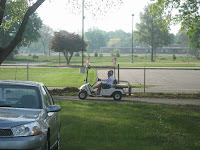 On Monday, Memorial Day was celebrated by a display of flags, a parade RV style and ceremony at the flag pole. It was a fun event and we will undoubtedly attend more in the future. We are back on the road, in what I have come to think of as our summer pattern. 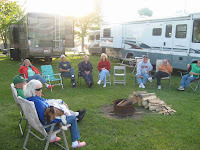 As members of a Winnebago owners club, FMCA-a motorhome owners club and, of course, the Good Sam-an organization devoted to the camping experience that means, among other things-rallies. 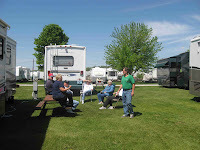 We started our summer program with a Winnebago rally at a nearby campground and reacquainted ourselves with our fellow members. As always there were lively discussions, good food and the traditional campfire. We stayed in a mostly seasonal campground where people spend the entire summer. The place was loaded with golf carts and we apparently quickly became the local attraction. 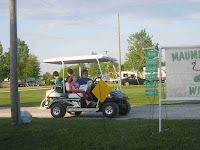 A steady stream of golf carts slowly where rolling by and occasionally stopped to chat. 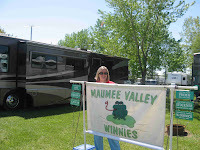 We had joined the FMCA-Family Motor Coach Association over the winter and planned to go to their much larger rally in Berrien Springs, MI a few days after the Winnebago event. So for the intervening few days we decided to head to Shipshewana, IN. 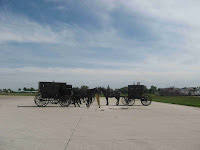 This is in the Indiana Amish country, which we explored last summer. (13 July 2007 story) When we started to travel, I thought that it would be a waste of time to revisit places we have already been, but I now find that revisits are also worthwhile. Not only to revisit specific places enjoyed, but I discovered that you can also get a complete new perspective on the place, often by chance. This time there was still the charming and simple farms and people of the Amish community and the apparent serenity of an area dominated by this lifestyle choice. We visited the Menno Hoff museum which traces the history of this religious and cultural group, as seen by them. This is a very well done museum and worth a visit. Plan to spend at least two hours. 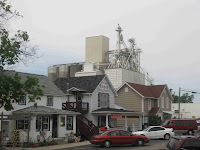 On this visit we spent a lot more time in Shipshewana and got to see a lot more than the flea market. 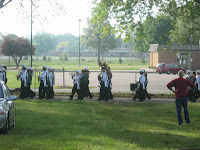 We walked the downtown district, which is mostly owned by Amish interests. By chance, we happened into the only non Amish ethnically owned business in town, owned by a well known Native American artist, who was a direct descendant of the native people who were driven from their lands by the federal Government at around the same time as the first Amish settlers arrived from Europe. Since we were the only potential customers in the place, we struck up a pleasant conversation with the owner’s son about the area and history of the place and his ancestors. When I remarked that it must be nice to live in the town and work among such quiet, honest and hard working people, I apparently hit his major button, and he gave us the low town on the Amish from his perspective. 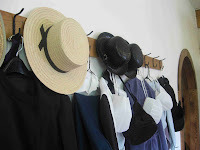 Let me just say that, at least as he saw it, they were a very unpleasant group of people to deal with and since they controlled the town, in which voting on any issues is not allowed, if you were not Amish, they made it extremely difficult for you to stay in business. He felt that there was one set of rules for the Amish and another for everyone else. 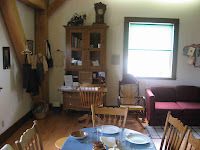 He pointed out that the references to what happened to his people at the time of the arrival of the Amish in the area did not even exist in the museum. His tribe pushed hard to have it acknowledged that their tribe occupied this land. He also said that, in fact, when the Amish arrived they moved directly into the houses and farms that had just been vacated by his people. The native people were moved to the west in what is now called the “Trail of Tears”. Certainly, in our travels, it can be seen that despite what was portrayed in the movies of my youth the native peoples in this land were treated very badly by the settlers and the government. I guess that this is no surprise to anyone. Whenever, I think about the Native American issues, I am always reminded of the posters and t-shirt with a picture of several famous well armed “Indian” leaders over the declaration of: Homeland Security since 1492. I can only hope we will fare better than they did. In any case, it is clear that a second visit this area has given us a whole new perspective. So we will not shy away from second visits in the future.